Taylor Swift won big at the American Music Awards last night (October 9), and she used the opportunity to once again encourage her fans to vote in next month's U.S. midterm elections. She took home four trophies last night, triumphing in the categories of Artist of the Year, Favorite Female Artist Pop/Rock, Favorite Album Pop/Rock and Tour of the Year — not to mention opening the show with a performance of "I Did Something Bad." 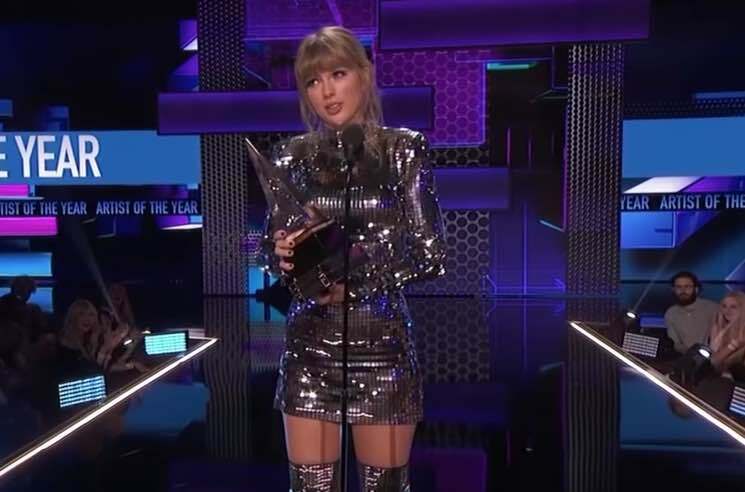 It was during Swift's acceptance speech for Artist of the Year at the end of the night, however, that she spoke out and encouraged viewers and fans to vote in the midterms. "This award and every single award given out tonight were voted on by the people," she said. "And you know what else is voted on by the people? The midterm elections on November 6. Get out and vote." Swift has previously been outspoken about the importance of voting, though it wasn't until this past weekend that she finally voiced her support for a particular political party and endorsed the Democratic candidates in the state of Tennessee. In related news, Swift's four wins brought her grand total of career American Music Awards to 23, surpassing the record for most AMA wins by a female. It was previously held by Whitney Houston with 21.